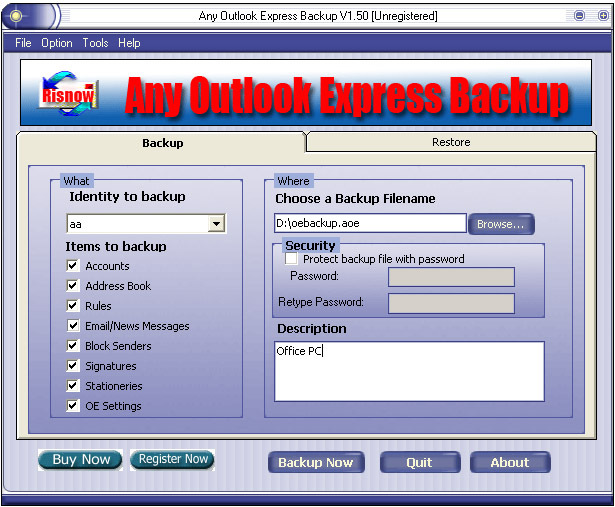 Any Outlook Express Backup - backup and restore your Outlook Express data. ...... This program is easy to use and has a simplified user interface, very useful for beginners. *Any Outlook Express Backup will easily move mail folders between two machines. *You can select a Identity to backup or restore. *Automatic Zip compression of backup files. *Protect backup files with passwords. *Add Comment for Backup archives. *An automatic backup Task scheduler enables you to start the backup process at any convenient date and time, and it allows you to schedule more than one backup task. Qweas is providing links to Any Outlook Express Backup 2.10 as a courtesy, and makes no representations regarding Any Outlook Express Backup or any other applications or any information related thereto. Any questions, complaints or claims regarding this application Any Outlook Express Backup 2.10 must be directed to the appropriate software vendor. You may click the publisher link of Any Outlook Express Backup on the top of this page to get more details about the vendor.